This century has witnessed numerous changes in all fields of human activity. The development in electrical science has been notable. It has spread over to electronics which has had a rather unprecedented development also due to military applications. Invention and application of tubes marked the field until the invention of semiconductors but the era of valves has not terminated yet. Designers of early valves some seventy years ago were even not fully aware of significance of their invention. Valves behave like wine -- they mature with age. 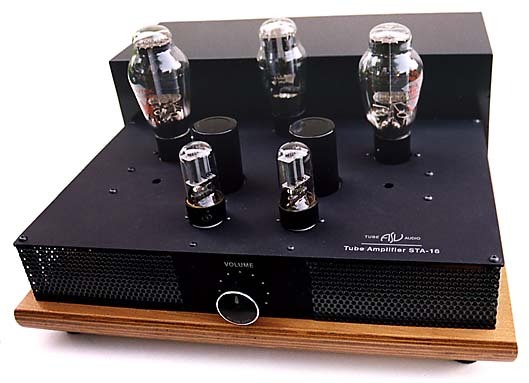 The ASV STA-16 is a classical tube amplifier with a single-ended circuit topology. It has several advantages, principally an excellent sound characteristic of this type of tube amps. It is true, however, that the output power is rather low, which could be compensated for by connecting more sensitive speakers. The cabinet is of a unique design too. There is a rather unique massive wood base board covered with a metal sheet both to cover the components and to carry the valves. The rectifying section and output transformers are sheltered under a metal grid cover at the rear part of the upper front panel board. The rear panel carries all input and output terminals as well as power switch while the large volume control knob is fitted on the front panel. All components built in the ASV STA-16 were carefully selected: polypropylene capacitors, metal film resistors, Alps potentiometer, ceramic tube sockets, toroidal power transformer, high quality electrolytics. In the basic design the single-ended topology with three active elements per channel was followed. As active components in the input stages, well known dual triodes 6SN7 are used. In the power stage the legendary 300B directly heated triodes work in cathode bias circuit. They drive high quality double C-core output transformers with a maximum power of approx. 8 watts. Input sensitivity is high enough to allow connecting line-level sources, for example a CD player, to the input. A high quality output transformer is the heart of a tube amplifier. A poor output transformer fitted in a well designed amplifier will spoil its performance. The transformer must deliver adequate and constant power without core saturation. It should provide wide bandwidth at minimum distortion. Moreover, it should provide constant outstanding performance to retain the open, spacious quality of recorded music. Due to reasons dealt with so far, the most delicate point of single-ended and other tube amps are output transformers. The core in a SE output transformer is also magnetized by DC current of output valve which requires an appropriate air gap between the core halves in order to prevent magnetic saturation of the core. Good linearity can only be achieved with a carefully calculated air gap. The sound quality of ASV output transformers is exceptional: low distortion and extremely wide frequency and dynamic ranges. The present SOT-10 transformer has a double C-core and is carefully wound, has no internal solder joints and is impregnated and encapsulated in a metal housing. The final results are excellent and also confirmed by measurements. The amplifier operates without overall negative feedback. This provides a clean, airy performance and is capable of delivering truly classic and warm tube sound. It re-creates a glory of tube sound, focuses well, and has very good depth and transparency with fine image width. The ASV STA-16 amplifier has been designed for assembling in the classical manner of manual soldering of all components and joints. All elements and connections are entirely hard-wired on the circuit assembly. No printed circuits are used in this amplifier. We believe that only such a design can, together with great degree of skill, know-how and enthusiasm, provide the result: warm, natural sound without disturbing, sharp transients.